The jewellery is beautiful and good value! 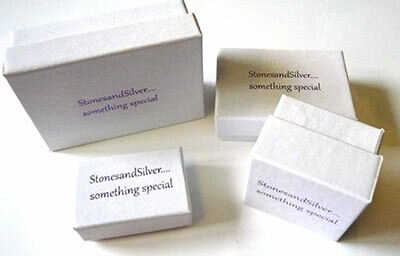 Birthstone Jewellery and Sterling Silver Locket and Silver Bracelet Specialists StonesandSilver. Quality solid silver jewellery and fast delivery. On Stones and Silver you will find beautiful semi precious stones, birthstones and a large range of solid silver lockets and silver bracelets. Only available online, our birthstone jewellery , silver bracelets< and silver lockets are very funky, well priced, striking and fun to wear. I have lots of very happy customers, please read my reviews and testimonials. You can have a look at the Stones and Silver reviews page or click on the Safebuy Logo on the top right of any page. I also have a lot of customer feedback on Amazon if you search for StonesandSilver. All the plain silver jewellery, sterling silver lockets, silver bracelets and jewellery with semi precious stones shown in this online shop is ready for immediate dispatch. Use the search box at the top of the page if you are looking for a particularly unusual stone Or browse “Unusual Stones” in the alphabet list. Please note most of my pieces are one offs, so if you see something you like it may not be available for very long! All of my silver lockets, solid silver bracelets and other silver jewellery are posted securely by FREE first class, recorded delivery, postage and packing (including simple gift boxes and for smaller items velvet pouches). Items can be sent by Special Delivery or to an International Address but please contact me before purchase as there will be an additional charge for postage. The FREE chains supplied with each pendant and silver lockets are 18 inches but I’m happy to fit a 16 inch chain if you would prefer (just let me know when ordering). If you want an even longer chain on your locket or pendant just let me know and I will give you a discounted price on longer silver chain, just email. All the sterling silver jewellery on StonesandSilver.co.uk has been either made by me or selected by me for you to enjoy. It is all top quality, fine (99% pure) or sterling (92.5%) (apart from the Copper and Bronze, Stainless Steel items, some of the findings on the Polymer Clay jewellery and the wire wrapped jewellery. Where these exceptions apply it is clearly stated in the page title and item description and these items are listed under “Other Metals” in the menu, otherwise you can take it for granted that it is all 925 solid sterling silver jewellery). Commissions – I currently am not taking any commission work apart from the simplest work (e.g. making sterling silver chains to length or doing easy repairs) as for creative reasons I want to concentrate on the work I personally want to do over the next year. My online jewellery shop stock changes all the time as I make new pieces, so if you can’t see anything you like today, please bookmark the site and come back in a few days to look again. Hallmarking is required on all solid silver jewellery over 7.76grammes. Sometimes you will see items displayed on the site without a price, these items are awaiting hallmarking. They are displayed just so you can see my entire silver jewellery stock at any point in time. Click the link for more information on hallmarking to comply with UK law.